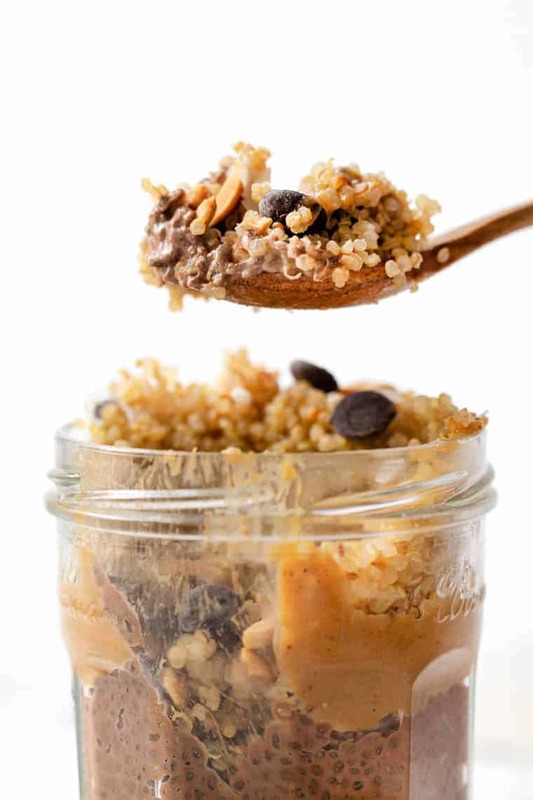 This quinoa breakfast parfait is made with a layer of rich chocolate chia pudding, a sweet peanut butter sauce, and quinoa, and it tastes like candy. When your breakfast involves chocolate, you know it's going to be a good day. And when your breakfast tastes like candy, it's even better. Better yet however is when your breakfast involves chocolate, tastes like candy AND is actually good for you. Now that, my friends, is where things get magical. I always like starting my day with something sweet. My usual go-to is a green smoothie, but sometimes I like to change things up. Even though I work from home, I still find myself rushing most mornings, which is why smoothies work for so well for me. But when I don't feel like sipping my breakfast, chia seed pudding is the perfect option. 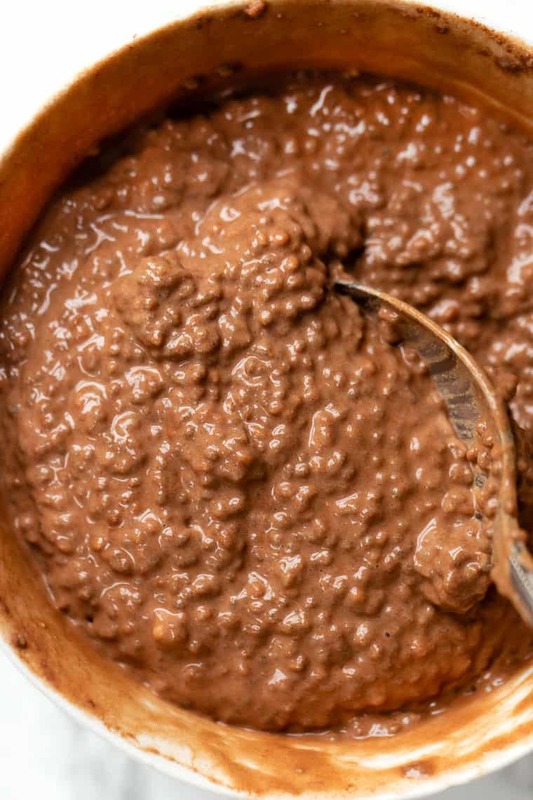 What I love about chia pudding is that it takes less than 5 minutes to make and yet it's incredibly decadent and filling. If you haven't tried it, think of it almost like a healthy version of rice pudding, except much tastier. If you're new to chia seeds, don't get weirded out by their gelatinous nature, these mini seeds have incredible nutritional benefits. For starters, they're loaded with fiber, omega-3 acids and hard to find minerals like manganese and phosphorus. Similar to quinoa, chia seeds also help regulate blood sugar, help keep you fuller for longer and are a great source of plant-based protein for vegetarians and vegans. Plus, they make a killer pudding! Okay, so back to the candy. My fave candy of all time is definitely a peanut butter cup. I've combined chocolate and peanut butter more ways than I can count and it's because this iconic duo is just heaven. And it totally works for breakfast too! 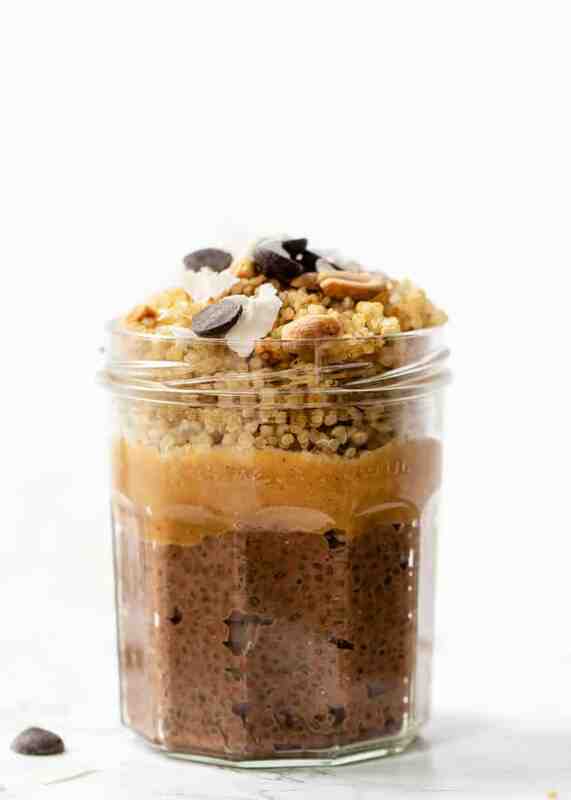 As our base, we've got the chocolate chia pudding. That's where we're getting our protein and most of the nutritional punch from this recipe. But my favorite part? 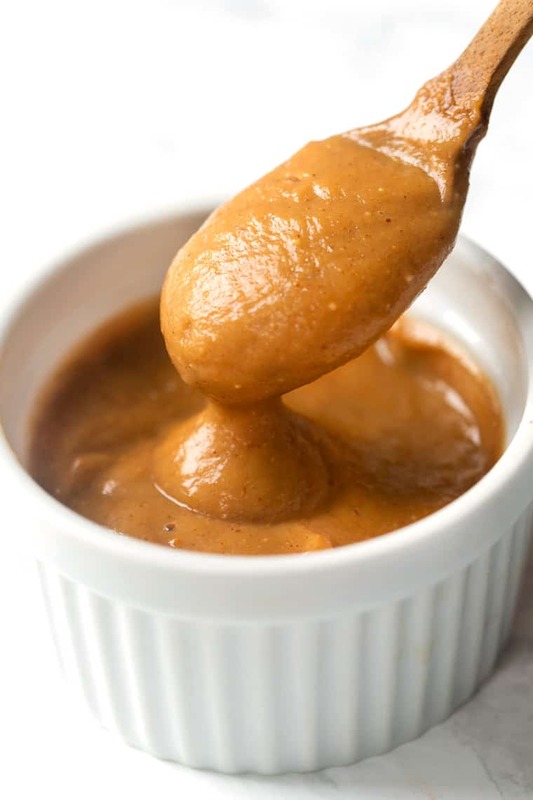 Definitely the healthy peanut butter sauce! It's creamy, it's sweet, it's gooey and it's the absolute most perfect center layer. And guess what's even better? It's just peanut butter, maple syrup and a touch of water. 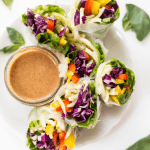 Whip those three things together and you have a seriously delicious peanut butter sauce that might taste like frosting but is super duper healthy! Now let's talk assembly of our breakfast parfaits. To make the chia pudding a little extra, I infused it with some vegan protein powder which makes the breakfast more filling and also lends a little sweetness without adding more sugar. Then there's the peanut butter sauce. Which like…yum! And we're finishing it off with a little cooked quinoa. The cooked quinoa is plain, which I actually quite like because it doesn't take away from the other two layers, but also adds a really nice fluffy texture. And as we know, quinoa is high in fiber, protein and lots of other minerals! The pudding part, you can totally make the night before! You simply mix up the ingredients, add them to a jar or bowl and let it sit to thicken in your refrigerator. 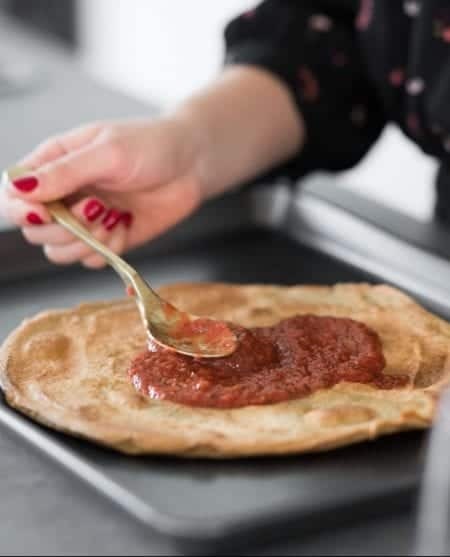 And then you wake up in the morning, your pudding will be set, so you just need to make your peanut butter sauce, layer them on up and breakfast will be ready. Like I said…less than 5 minutes! You can actually also just make the whole thing the day before – or save it for a few days in the fridge. I did this last week and it was delicious 3 days later! 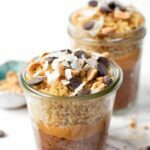 Ultimately, as much as I love that these quinoa breakfast parfaits are meal prep-friendly, my favorite part is the complex layers of textures. The pudding is thick and has a slight crunch from the chia seeds, the sauce is velvety smooth, and the quinoa is soft and fluffy. 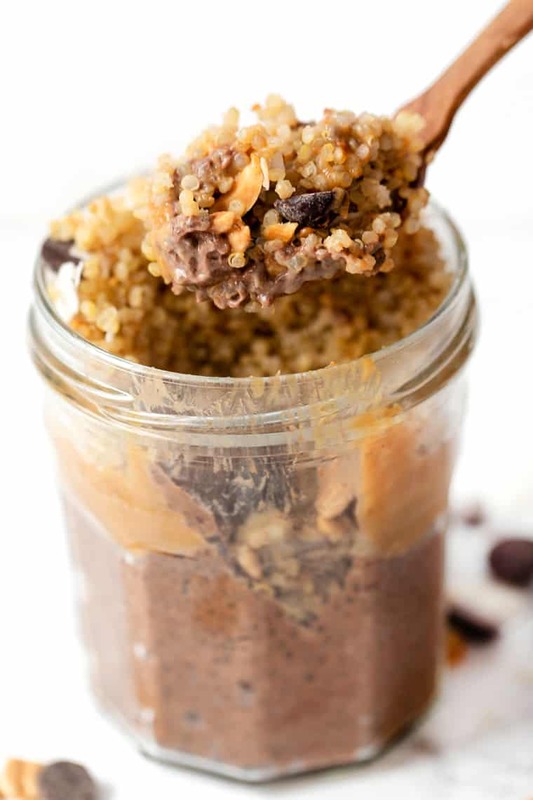 This Chocolate Peanut Butter Quinoa Breakfast Parfait is the BEST way to start your day! 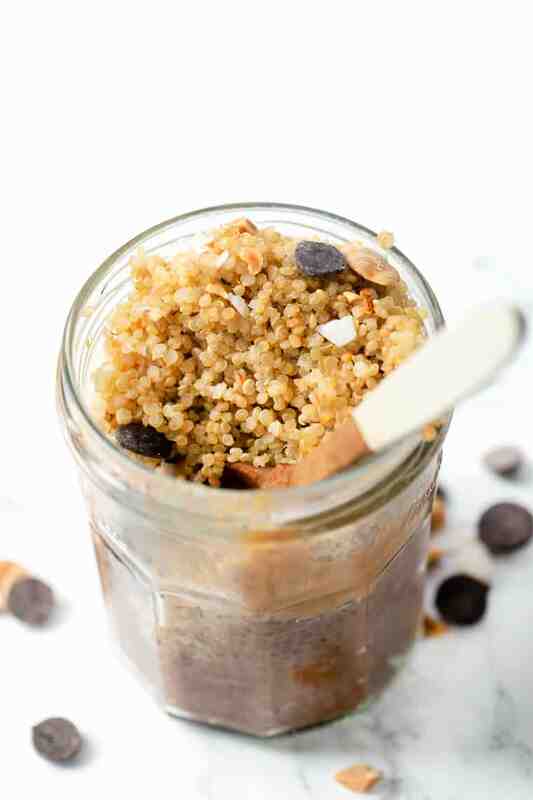 This vegan-friendly recipe seriously tastes like breakfast for dessert but is super healthy and you can make it in a mason jar ahead of time! The night before you want to eat this breakfast, whisk together the chia seeds, protein powder, cacao and milk. 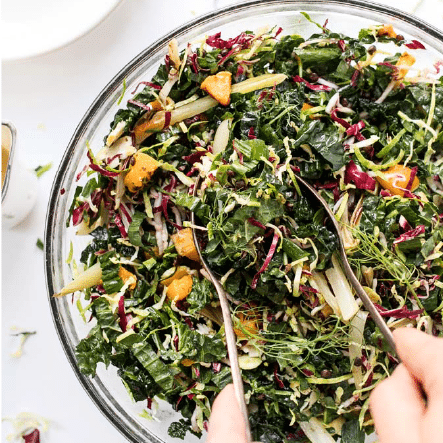 Place it in a bowl or mason jar and refrigerator overnight (or for at least 2 hours). When ready to serve, remove chia pudding from the fridge and separate into two glasses. Mix together the peanut butter, honey and water until smooth. Add a scoop on top of the chia pudding and smooth to form an even layer. 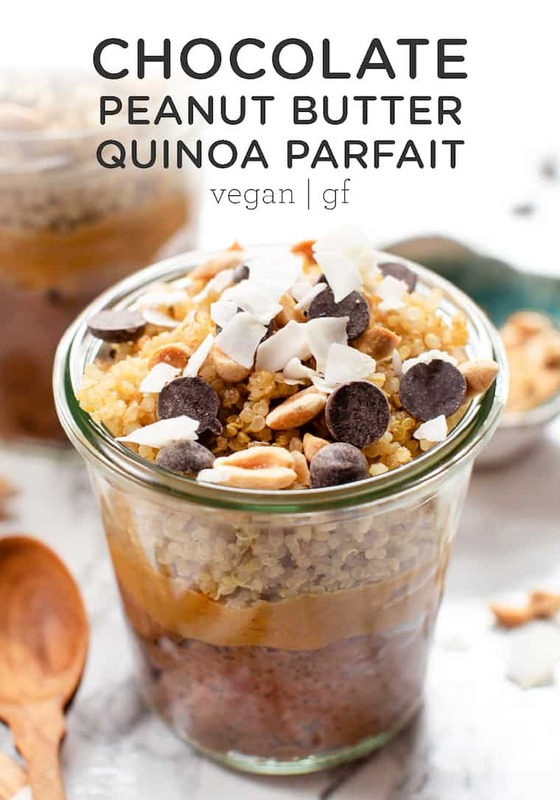 Add 1/2 cup quinoa atop the peanut butter and garnish with a few chocolate chips. 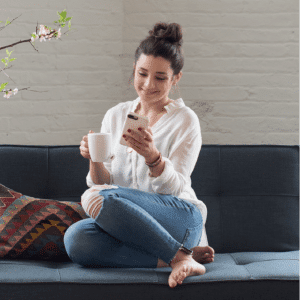 Does the milk have to be non-dairy? I can’t think of a more amazing way to start your day than with this parfait! Peanut buter and chocolate is an all time favorite combo!! Love that this is so quick and I can make a complete version for me and a peanut butter-free version for my husband. Love the layers in this!!! You said the magic words!! “CHOCOLATE & PEANUT BUTTER!! !” Music to my ears! WIth the added benefit of Chia and Quinoa and I am completely sold!!! How many grams of protein powder? Can you post the nutritional information for this recipe? It is amazing. I made it 4 times and since I live alone get to eat it twice (two separate days) each time I make it. I’m waiting for the Chia seed, cocoa powder and milk to gel so I can put it together again. Happy healthy and safe new Year to all. A co worker of mine was eating this and it looks/sounds amazing! Is there Anything else you could substitute for honey though? Or can you just leave it out? This made me smile. This parfait is definitely going to make my mornings better. As any breakfast that tastes like candy should 😉 Enjoy it! Alyssa, this looks amazing! I think I have everything I need to make it. Thank you! I hope you ended up trying it; definitely one of my absolute favorite breakfasts ever. Well hello gorgeous! Love the new site Alyssa! It is stunning. And okay, I am putting chia on my shopping list for this afternoon. I am officially convinced! Thanks, Katie! I really appreciate the kind words 🙂 And YES you must put chia on your shopping list, this pudding is totally to die for. Haha great minds think alike! Hope you enjoyed it – I love when it tastes like I’m eating candy but I’m actually eating something healthy. Nothing better!